NatSteel believes in contributing to the economic and social development of the community, wherever it operates. NatSteel endeavours to improve the quality of life of the community through corporate philanthropy and volunteering. Across its operating geographies, NatSteel has participated actively in community initiatives in areas such as education support and disaster relief. 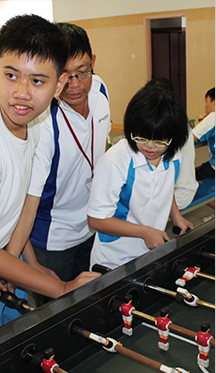 In Singapore, NatSteel promotes staff volunteerism through monthly activities with its three partners, SPD, Fernvale Gardens School and Food from the Heart. Through policies such as leave for community involvement activities, NatSteel encourages its employees to participate in at least one community involvement activity per year. NatSteel is a staunch supporter of education, having donated over S$400,000 to the NatSteel-SPD Bursary Award since 2008. The bursaries benefit children with physical disabilities or disabled children. Till date, NatSteel has also disbursed over S$500,000 through its in-house bursary award for its employees’ children.